I’ll admit it – I am not a huge apple fan, but I had to switch up breakfast the other day, plus we had 1,000 apples to hurry and eat. This recipe was actually super delicious. It was sweet enough to eat without syrup even. I love to spread peanut butter on my pancakes and it gets nice and melted and delicious. These were a huge hit. Give ’em a try for a weekend breakfast. Mix ingredients and drop by 1/3 a cup onto a hot griddle. They melt in your mouth. mmmmm. Oh! And I’ve been in the Valley of the Sun (Phoenix) all week for my little sis’ WEDDING! So excited. I’ll post pics when we get back. Have a great weekend. 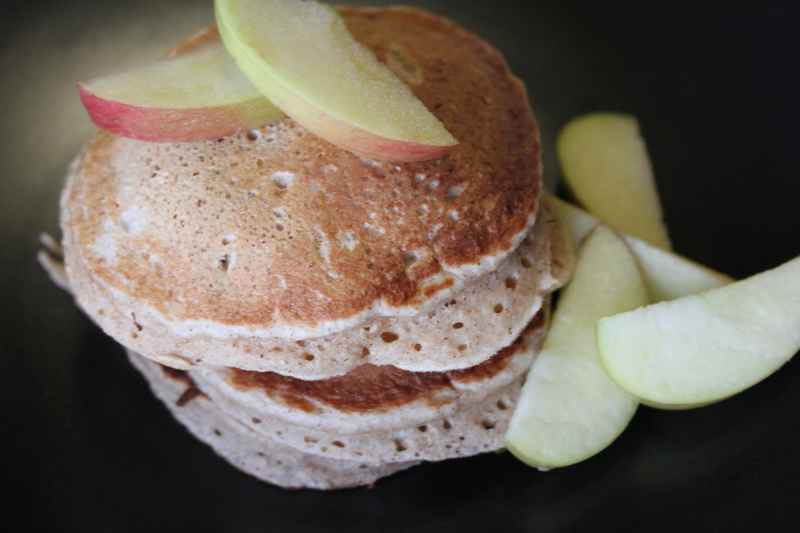 This entry was posted in Breakfast, Recipes and tagged apple cinnammon pancakes, apples, pancakes, whole wheat pancakes. Not an apple fan? Mad. I think these look and sound yum.